The close-up of the right side of the control panel in the Plum Brook Facility shows the controls for the manual operation of the shim rods. In this historical photo from the U.S. space agency, this close-up of the right side of the control panel in the reactor control room shows the controls for the manual operation of the shim rods. Each rod has its own speed dial, meter, indicator lights, control buttons, and scram button. The buttons within the square on the left-hand side controlled the regulating rod that could activate a junior "scram" (a partial scram using only one regulating rod). It was designated within the box so that operators could quickly locate the rod's control buttons in case of emergency. 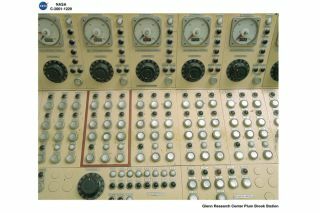 The full scram buttons, which dropped all the control rods simultaneously, were set apart at the bottom of the console.